SP-1 is a pretty powerful program. One of the things that makes it so powerful is the flexibility on the little things. I thought it would be beneficial to cover the different ways you can setup a discount in SP-1. This blog was inspired by a conversation with Mark at Blackstone Pizza in Iron Mountain MI. Mark had some questions on how to manage discounts with his employees. First, remember that you can have unlimited discounts in SP-1. Each discount can be setup to only discount a specific item at a specific time and a specific day! So, you can actually setup a discount that would give 10% off sandwiches on Tuesdays between 2pm and 4pm. That discount would only work at that time. All discounts in SP-1 are a dollar or percentage off an item or items. Let’s cover some of these fields and see how they work. Discount: This is the discount name that is used. 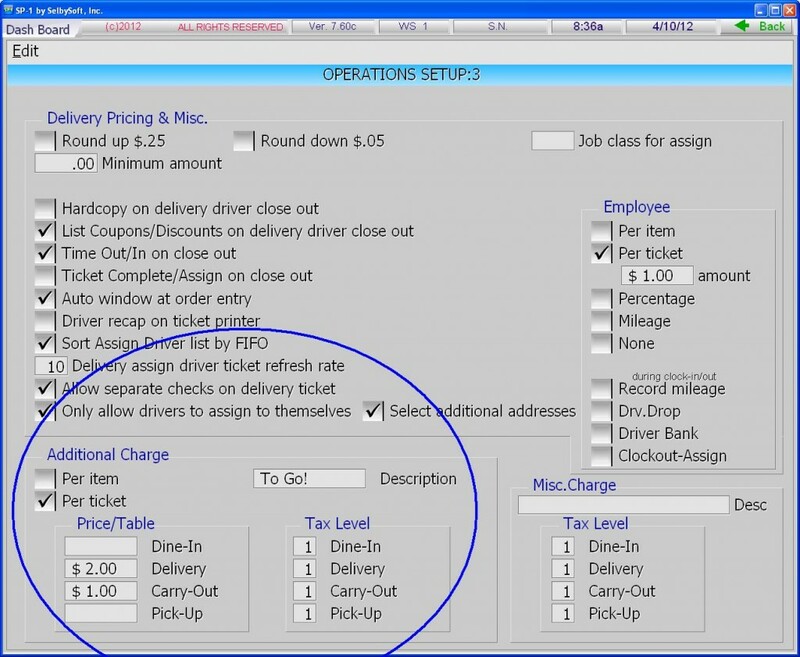 This is how the discount is identified on reports and on the order screen when it is used. 1) Percentage discount – the amount entered here is a percent. 2) If you are setting this up as a dollar amount discount then this will be the amount that the discount is for. 3) If this is left blank, then it is a manual discount. Manual discounts require the employee to enter the amount to be discounted. Usually not something that you want to leave without a security level. Expire: This discount will no longer be available 30 days after this date. Dollar Amount: Select this to have a dollar amount discount. If you had entered $10.00 into the Price/Table field, then this would be a $10 off discount. Percentage: If this is selected, SP-1 will use this as a percentage discount. If you had entered $10.00 into the Price/Table field, then this would be a 10% discount. Line Item: Line item is a special percentage that will only apply to one specific item on the ticket. This is a great way to discount a specific item in the case of a mistake. Max.Disc.Amount: With this, you can enter the MAXIMUM amount an employee can discount! In the example above, you can enter any discount amount up to 10%. It’s a great way to limit what employees can discount. Reward Pts.%: Setting this to zero means that any items that are discounted are excluded from the rewards! This stops “double dipping” for those of you doing buy 10 get 1 free programs. Cust.Reward: Select this if this is a reward discount. Reward discounts are used with the free gift and loyalty system included with SP-1. Misc.Charge. : Can you discount a miscellaneous charge. Gift Card: Can you discount a gift card sale. This is very powerful as it allows you to be able to discount gift or pre-paid cards that customers purchase. Security Level: Yes, you can password protect discounts. This is important so employees don’t use discounts they are not supposed to use. Comp: This will allow you to setup a specific discount that is used to ‘comp’ a customer. This discount option affects your server and delivery close outs as well. Dine In / Carry-Out / Pick-Up / Delivery: These switches set the discount to be order type specific. If you want a carry out only discount, this is how you would do it! Menu Items: This is where you specify, exactly, what items are allowed in this discount. Don’t hesitate to tell us how you use your discounts or if you have any comments! 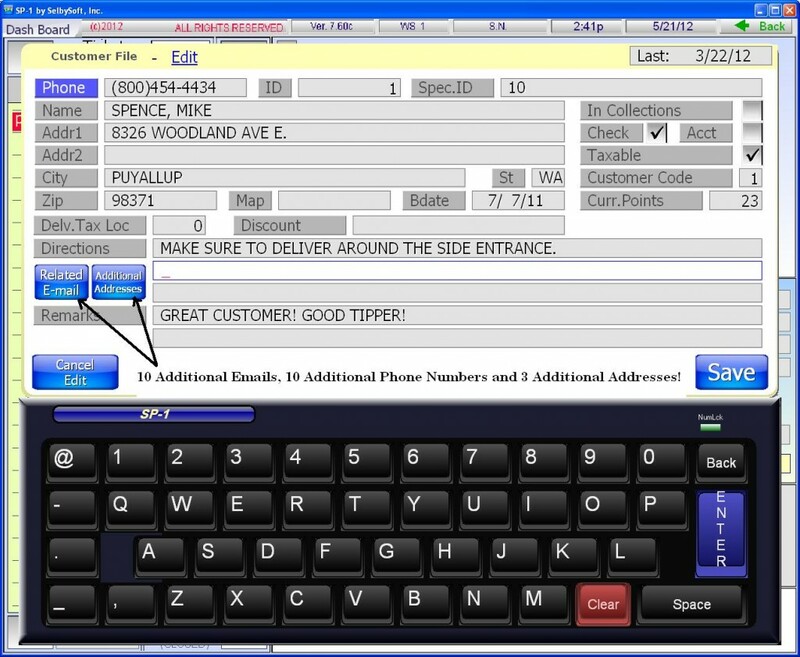 For those of you that have our SP-1 touch screen point of sale system, here are five tips that you might not be aware of. 1. Do you often have an ‘on the side’, ‘extra hot’ or ‘see cashier’ comment? You can create up to thirteen pre-programmed comments to use in the Order Screen. That’s right, you don’t have to have every comment be a manual input. This can be setup in System Setup and then Comments. 2. Last ticket look up. Ever want to re-print that receipt for the customer? Easy. Review ticket and enter 9999. Because SP-1 can store up to 9,999 tickets per day, entering 9999 automatically pulls up the last ticket in the system. 4. Print labels. Actually two different kinds of labels. We can print your retail barcodes and also delivery box labels. Retail labels allow you to use a barcode scanner to quickly ring in retail items. Boxlabels are a great choice for making sure that your delivery drivers are able to see what needs to be delivered where. 5. Send employee messages. That’s right, you can type an internal email in SP-1. Better yet, that email will show up when the employee clocks in! Hopefully you are aware that you can store a customers information in SP-1. Do you know all the ways you can bring that customer up? This gives you the flexibility to be able to look up a customer by virtually anything you would like! Do you run a happy hour? We see that as a great way to help bring people in during the ‘slow time’ of the day. One of the problems with Happy Hour pricing is open tabs. If I start a tab but don’t close the ticket, do I still qualify for happy hour? Base pricing on start time: With this method selected, your pricing on open tabs is based on when the customer opened the tab. This is used to encourage customers to stay at a table and keep ordering. If you offer a $.50 discount per drink during happy hour, this method would extend that pricing until the ticket was closed. Base pricing on actual time: This is the most common method of these orders. Pricing is based on the actual time that the item is ordered. Don’t forget that SelbySoft allows up to nine prices per item per day with our price tables. This allows you to have these happy hour prices automatically take effect. Do you charge a surcharge for delivery when gas prices shoot up? What about charging a to go or carry out fee? SP-1 can handle both of these situations easily. Because we can track the order type when the ticket is finished, it makes it easy for us to add an additional fee to the ticket based on the order type. In the example below, we are charging $2.00 for each delivery and $1.00 for each to go ticket that we do. SP-1 can even take this a step further and allow you to charge by the item instead. This would then add a charge to each item on the ticket. This is great for charging $.10 per item on to go or carry out orders!